An adjustable rate mortgage's interest rate varies over the life of the loan. The interest rate at the beginning of the loanwill often be a comparatively low interest rate, known as the introductory or teaser rate. Thisteaser rate will hold for a certain time period. After the teaser rateperiod is over the interest will vary every 6 to 12 months, although some can vary every month. The actual interest rate varies based on how interest rates are doing in general. If interest rates are up then the ARM will also be up, and if interest rates are down the ARM will also be down. When the interest rate of an ARM changes so will the monthly payment made, thus there is a risk that the monthly payment will become larger. Adjustable rate mortgages will start out with a lower interest rate compared to a fixed rate mortgage, so you can borrow more, however it is important to keep in mind that interests rates can go up!! As well as your monthly payment!! Getting an ARM can save money if you know that you can afford the higher payments in the future. If you purchase when interest rates are high then ARM will save money because of lower interest rates at the start. 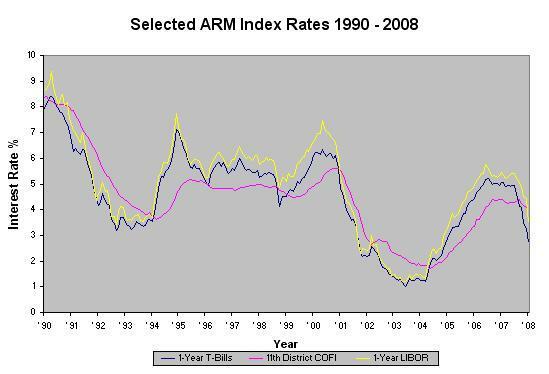 Then when interest rates go down so will the rate on the ARM. Also if a refinance is not possible then you will still be able to reap the benefits of falling interest rates. Another benefit of an ARM mortgage is that they are usually assumable, which means they can be transferred from one person to another. This is a good feature to have especially if interest rates are very high, as they were in the 1980's, and you need to sell. However, some ARM's may have clauses that only allow them to be assumed once. Based on what the United States Federal Government pays on it's debt. There are both 6 month and 12 month Treasury Bills. Treasury Bills tend to respond quickly to the interest rate changes and so are good when interest rates are falling, however they will be bad if interest rates are rising. ARM's can be based on the average banks pay on 6 month Certificate of Deposits. Certificate of Deposits areinterest baring notes issued by banks and credit unions. These are also volatile, but they aren't as volatile as Treasury Bills. The rates for Certificate of Deposits are usually slower to increase, but faster to decrease. The CoFI is the weighted average interest rate paid by the 11th Federal Home Loan Bank Districton checking and savings accounts.ARMs tied to the CoFI tend to respond slower to changes in interest rates, both up and down. Because of the slower response of the CoFI, ARM's will usually start at higher interest rates than ARMs with other indexes. Despite the higher rates, the CoFI provides the most protection against sudden rises in interest rates. In the case of falling interest rates, the option to refinance is also there. The LIBOR is the average interest rates large international banks charge to borrow American dollars in London's financial market. The index tends to be volatile similar to T-Bills and CD's index. This index is used by foreign investors who purchase American Loans as investments. In order to choose the right index, you should ask yourself how a particular index has performed in the last 5-10 years. Although past performance doesn't guarantee future values, it will give you a bases to judge the indexes. This cap limits the maximum change in interest rate that can happen in an adjustment interval, usually for 6 months they will be ± 1%, and for 12 months they will be ± 2%. In many cases the initial adjustment from the teaser rate to thefull index rate is not subject to a periodic rate cap, and can result in a rather dramatic interest rate increase. Also keep in mind that when rates fall rapidly the ARM may not respond as fast as you would like, since the periodic rate cap applies to increases and decreases. These caps limit the absolute interest rate on the loan. Interest rate on the loan will never go above the maximum set by the cap. Make sureyou are able to afford the monthly payments on this worst case, highestinterest rate. This way you won't be facing default if higher paymentscome due. Negative amortization occurs when the payment on the loan does not cover the interest, and thus the remaining amount is added back to the loan principal, and now more money is owed than before. Some ARM will limit maximum monthly payments instead of the maximum interest rate, the problem here is that even with maximum monthly payment, it might not cover the interest on the loan, thus leading to negative amortization.Make sure to specifically ask if the loan has the potential for negative amortization. Adjustable rate mortgages can save you money in the long run. However, they can alsocost you more money if interest rates increase dramatically. ARMs are best suited forthose who can afford the higher payments when interest rates go up, but want to takeadvantage of the potentially lower payments.